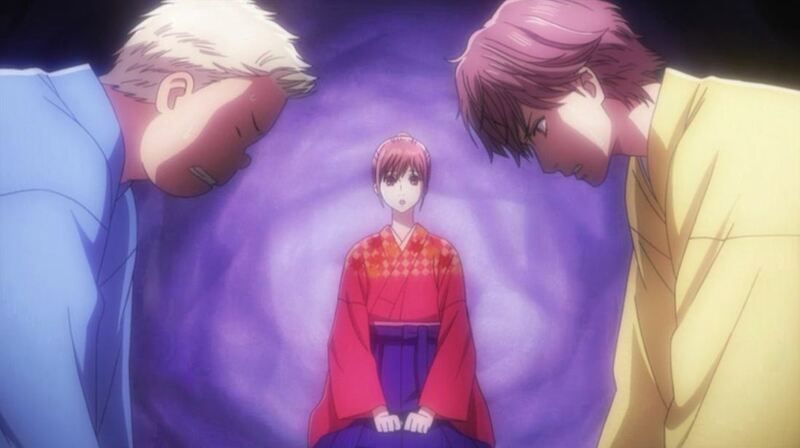 This week’s episode picks up where we left off last week; Chihaya is torn between watching Kanade and Komano compete or Taichi and Nishida compete for a rank increase at the local tournament. At this point, she’s enthralled with watching Kanade and Komano play since she’s trying to learn as much as she possibly can from them. As the episode starts up, we see Taichi and Nishida fighting valiantly for a card and Taichi is able to get the card in time. As he goes to pick it up, he starts thinking about how he’s sure Chihaya is proud of him, but when he looks up and notices that Chihaya is focused solely on the other match, he’s crushed. Going back to Kanade and Komano’s match, things are starting to heat up because Kanade has a six card lead and there’s only ten cards left on the playing field. When the next card is read, Komano is able to take a card from Kanade, narrowing the gap between them in terms of score. Chihaya notices that he’s becoming rather confident in himself, but because of this, he slips up and sends the wrong card. Chihaya mentally goes through what happens when Komano is playing a game; he’ll start to catch up but then he makes mistakes and starts to give up. Just as she says, when Kanade is able to take the next card, Komano starts thinking that he won’t be able to win and that he should just give up. However, unlike previous matches, he sees Kanade sweating profusely and giving it her all and is determined to play his best. He then asks for a moment to move his cards and takes a risky move by combining all of his cards on one side of the playing field. The spectators murmur about this risky move he took, saying that it appears as though he’s going to be gambling on the cards being read on his side of the field. However, it seems as though his plan is going to work. Every card that is read in quick succession is on his side of the playing field and he’s able to hit all of them and send them flying. Unfortunately for Komano, Kanade is able to snag the ‘chihayafuru’ card from him and that leaves only three or four cards left on the field. The next card that’s read is on Kanade’s side and she manages to snag it before Komano and she wins the match! Komano seems a bit defeated, but he’s still happy that Kanade was able to win. 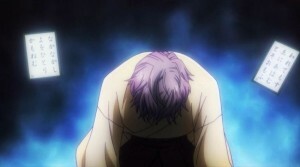 After thanking each other for the match, Kanade remains in a bow, as if she were trying to apologize to Komano. He smiles and congratulates her and the two share a sweet moment together. Chihaya is beyond thrilled for Kanade but then she realizes that there’s still Taichi and Nishida’s match going on. Taichi is trying to remember what cards have been read and which are on the field still and the two of them seem incredibly focuses and ready to win. 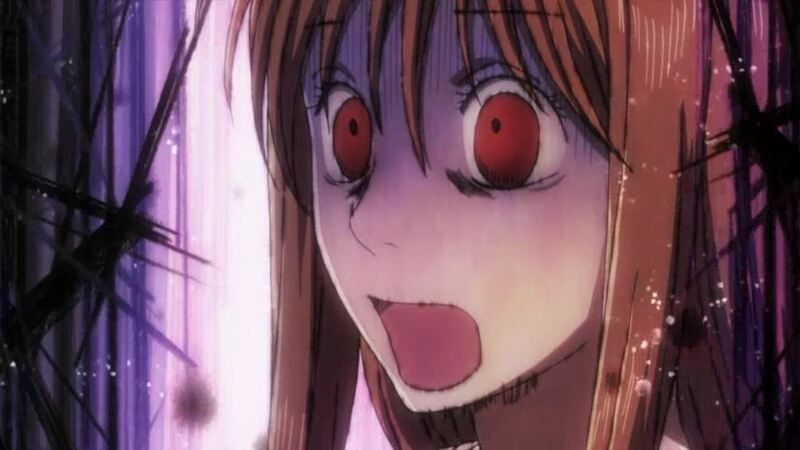 Chihaya looks over and suddenly regrets not paying attention to their match. She begs Retro to let her know what happened, but he’s so focuses on the match that he doesn’t even pay attention to her when she shakes him. As everyone watches the last match being played, I’m surprised at the tension between Taichi and Nishida. Both of them are so determined to win that it actually made me tense up just watching them! Each card that is read is a battle and somehow, it comes down to two cards – one on each side of the playing field. Everyone watching the game is shocked that such an intense game is coming down to pure luck, but Taichi doesn’t seem to think that luck has anything to do with it. He mentally runs through all of the ‘the’ cards that have and haven’t been read; turns out there’s 16 in total and only half of them have been read so far. Nishida takes a defensive stance, but Taichi still remains on the attack as the cards are read. Unfortunately, every card that’s read seems to be a dead card and Retro thinks about how draining it is to tense up for a card and then relax, only to repeat the process. When he really looks at the two players, he notices that they aren’t relaxing at all; they’re staying tense and focused for when the next card is read! Taichi continues attacking while Nishida continues to defend his card until the final card is read. Nishida’s card is read, but he’s able to cover it before Taichi can get it, which allows him to win the match. They thank each other for the game, but it’s clear that Taichi is upset that he lost the game. After everyone puts away the cards and changes into their normal clothes, Taichi heads out into the lobby and starts thinking about the game. If anything, he’s beating himself up about how he could have taken more cards in the first half of the game and if he had managed that, it wouldn’t have come down to two cards in the end of the match. Nishida sits down next to him and the two chat for a bit and Nishida admits that he enjoys playing against Taichi because he’s the only one who doesn’t call him a stupid nickname. Of course, Chihaya overhears them and is devastated to find out that Nishida hates his nickname and thinks that she’s a complete airhead. Kanade’s mother gathers them all together and drives them home in the company van. Everyone is talking about the outcomes of the match and everyone is so proud of Kanade and Komano for advancing a rank (apparently both the winner and runner-up in Class D advance to Class C in tournaments like the one they were just in) and they’re proud of Nishida for advancing to Class A. Chihaya says that she wants to play another group tournament with them because it was so much fun last time and she missed it. Kanade seems to get excited about it as well, seeing as they now have two Class C players, one Class B player and two Class A players. 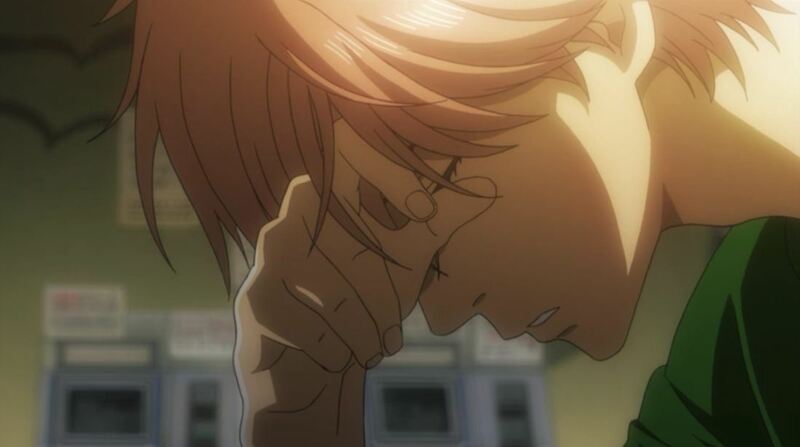 Taichi ends up falling asleep on the way back and everyone teases Chihaya for trying not to call anyone by the nicknames she gave them. 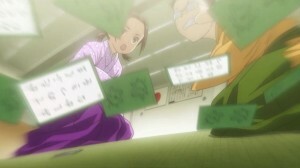 Meanwhile, we see Arata at his teacher’s place and notices the results from the last tournament in Tokyo. His teacher comments on how everyone in Tokyo is so competitive, but Arata is focused more or less on Taichi’s name. He finally tells his teacher that he wants to enter the western qualifier, much to his teacher’s excitement. Opinions: This was quite the tense episode! While not a whole lot happened, other than finding out who won the matches, I enjoyed watching it. Taichi and Nishida’s match was incredibly tense, especially towards the end, and they had me on the edge of my seat throughout the match. Kanade and Komano’s match was also fun to watch and I was happy to see Kanade win and Komano find the determination he desperately needs in order to keep competing. I understand Taichi’s frustrations at not winning, but he also shouldn’t be beating himself up about it all the time. That aside, I’m happy to see that Arata will be competing in the qualifier since that means that he might be facing Nishida or Chihaya in a match.